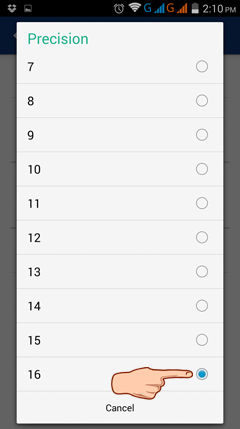 To be able to round numbers, first set the number format to decimal, engineering or scientific notation by tapping the menu button and selecting Settings > Calc > Number format in order. 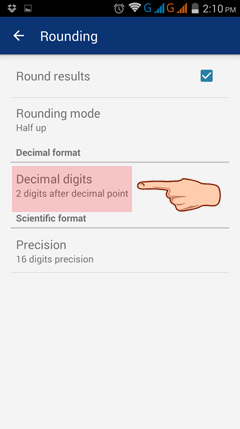 Then, tap Rounding (next to number format) > Decimal digits > choose the number of digits to round to. 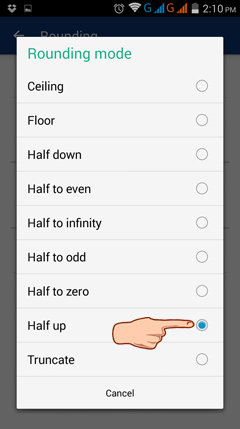 Rounding mode can also be changed to ceiling, floor, half down, half to even, half to infinity, half to odd, half to zero, half up or truncate. To change between rounding modes, tap Rounding > Rounding mode > choose the preferred rounding. Set the number of significant digits by going to Rounding > Precision > choose the number of digits. 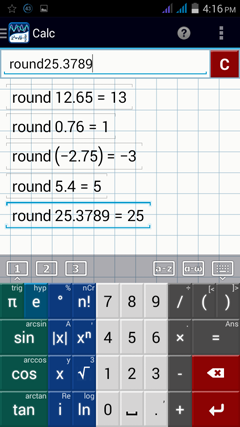 To round numbers to the nearest integer, type "round" using the letter keys. Then enter the argument. Round the following numbers to the nearest integer. Type "round" and enter the expression as it appears in each problem.